I received a box of Kiss Nail Dress Nail Strips included in a “Love Vox Box” through the Influenster program. Up until this point, I had never tried any type of nail art sticker, so I wasn’t too sure if I’d be able to apply the strip successfully. 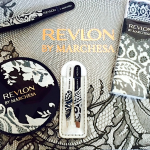 I was sent a box that had an animal print on it–cute! I really like the trend right now of doing an accent nail, so I chose to apply the Nail Dress nail strip on my ring finger (Note: the nail polish I’m wearing is Revlon ColorStay Nail Enamel in Bold Sangria). I was impressed at how well the Nail Dress strip stayed on–5 days–til I got a fresh mani! 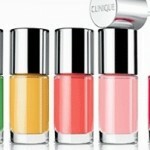 To apply, start by prepping your nail with alcohol or polish remover. 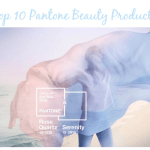 Each kit contains 28 Nail Dress strips in 14 sizes to fit your nails. 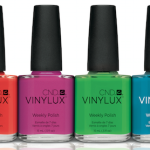 Choose the size that best fits then apply near cuticle and smooth away from center of the nail. Fold down over the edge of nail and file excess. You can mix and match any texture and pattern by cutting up Nail Dress and applying the strips in any shape or form desired to revamp any look, day or night. So if you want to cut crescents or jeweled stars, you can do that! 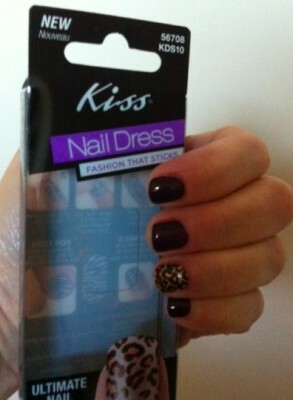 Kiss Nail Dress nail strips are available at Walgreens, Walmart, CVS and Kmart stores nationwide, $6.99. Have you tried Kiss Nail Dress nail strips yet? Let me know in the comments! 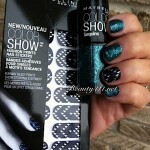 Maybelline New York Color Show Fashion Prints Nail Stickers & Sequin Nail Polish!